Volvo is now offering a new vehicle to all UK emergency ambulance services to help meet front line rapid response requirements. The Volvo S80 Ambulance has been designed and built in conjunction with Wiman, one of Europe's leading ambulance manufacturers and is available in right hand drive guise from early November. It is the world's first ambulance to be given Whole Vehicle Type Approval and has been built with safety in mind for both crew and patient. 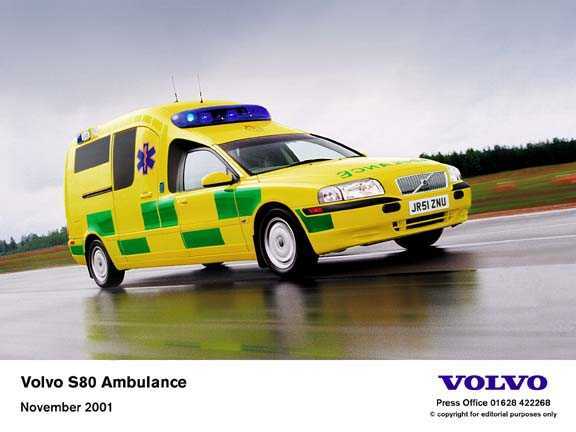 By using the Volvo S80 platform, Volvo has produced an ambulance, which offers the handling characteristics of a car. This means it performs well when tackling heavy traffic conditions, has the ability to respond to incidents more quickly and efficiently than a full size ambulance and also offers superb driver and patient comfort. According to Volvo's ambulance sales manager Nick Vannozzi, the S80 is capable of changing the face of front line ambulance use and, to date, 25 UK ambulance services have requested to test-drive the new model. 'With NHS ambulance trusts all being judged on incident response times, car-based ambulances such as the S80 can offer a real alternative to the standard ambulance,' he said. 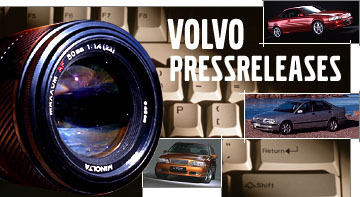 'The S80 offers significantly better performance and handling than most vehicles. Car-based ambulances have been used in Europe for some time, and we are confident the S80 can help cater for the changing needs of UK health authorities,' he added. The S80 ambulance costs between £53,000 and £65,000 depending on its specification, and is available with a choice of 170 bhp or 200 bhp engines, and with either a manual or automatic gearbox. Four-wheel drive is also available for those authorities that want to ensure their front line vehicles can tackle the most difficult of driving conditions. Drivers and passengers also benefit from the standard high level of Volvo S80 safety equipment including ABS, front and side airbags and safety belts with pre-tensioners. In addition, each S80 ambulance is equipped with a reinforced chassis and load compensating rear suspension.